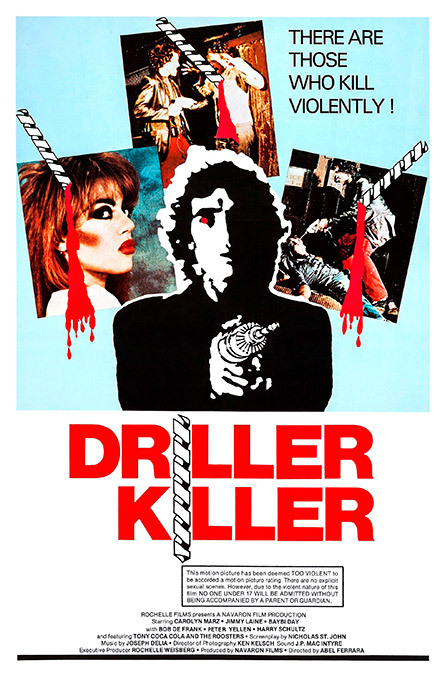 The Driller Killer is a lurid little ditty that came out in 1979. The title is way better than the flick, though. Regardless of the promise of exquisite gore and Broadway-caliber acting, it’s still a piece of crap all these years later. Except for the two chicks showering part. I’ll get to that in a sec. 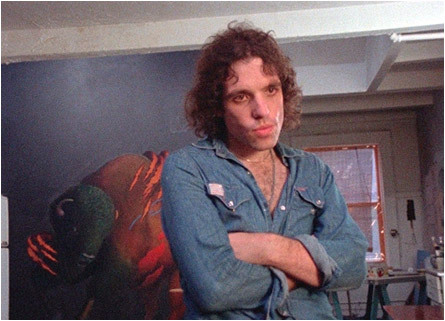 Reno is a hot-tempered artist (angry hippie with a paintbrush) and his next masterpiece is the one that’ll pay the rent for him and the two chicks he lives with in a rundown slum. His agent won’t front him any cash. A crappy punk rock band just moved in downstairs and practices all night, every night. The New York streets outside are littered with the mentally ill, the criminally-minded and the stinky homeless. All this feeds Reno’s growing anxiety and ill mood. His brain — not unlike rubber band suspenders — is about to snap. Then Reno sees a commercial on TV for a new drill that comes with a Porta-Pak™, which allows holder of said drill to move around without the tool coming unplugged. Remember, this was in 1979, long before batteries were invented. Reno’s latest painting is that of a buffalo getting a proctology exam, hence the shocked look on the buffalo’s face. That’s what it looked like to me, anyway. Needing inspiration and a way to vent, he buys the drill and runs out into the night to make vents in the homeless. As immediately gratifying as this is, it doesn’t soothe his fraying nerves caused by the incessant noise from the band downstairs, his nagging girlfriend or his agent, who just told him his painting is the worst thing he’s ever seen. I ask you, would you not buy a painting of a buffalo getting a proctology exam? I sure as hell would. So Reno straps on the power tool and goes out to aerate as many people as he can. 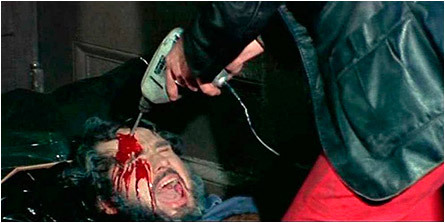 All of the killings are non-graphic, except for the close-up of his agent’s head when Reno takes his time on the screaming critic. Whaddaya know — the punk band’s noise comes in handy when covering up the shrieks of the power tooled. Reno’s girlfriend has had it and goes back to her husband. Guess who follows? [Insert revving power tool sounds here]. Oh, yeah — Reno’s chick roommates take a shower together. This was most excellent and absolutely integral to the plot, the message being that it’s important to maintain proper cleanliness and hygiene as it applies to all nooks AND crannies. I’m supportive of that stuff. This entry was posted on March 6, 2019 at 4:40 pm and is filed under Classic Horror, Slashers with tags Broadway, Classic Horror, gore, hippie, Slashers, The Driller Killer. You can follow any responses to this entry through the RSS 2.0 feed. You can skip to the end and leave a response. Pinging is currently not allowed.